The city of Los Angeles is widespread, stretching from East L.A. to the beaches with several neighborhoods within its perimeter. Depending on which way you're driving, you could travel almost 50 miles without ever leaving the city. Because of its size, it can be tough to navigate, especially in a way that minimizes the path through L.A.'s infamous traffic. Plus, the city has a few unique rules and customs even if you are used to driving in other large U.S. cities. Use this guide to get around L.A. efficiently and safely. While driving in L.A. is similar to other areas of the U.S., there are a few specific rules to note, particularly about types of lanes, cell phone, and motorcycles. Carpool/HOV lanes: On many L.A. freeways, one or more lanes at the far left are designated as High Occupancy Vehicle (HOV) lanes. Carpool Lanes are designated with a diamond painted on the pavement, and most of them have limited access and you can only enter or exit where there is a break in the double yellow line. Most carpool lanes require a minimum of two occupants in the car, some require three (the number is marked at the entrance). Vehicles towing trailers are NOT allowed in the carpool lane, regardless of how many people are in the car. Toll lanes: On certain freeways, the carpool lanes are double-purposed as toll lanes for people driving solo who have a Fastrak or other related transponder. Since this change, you also have to have a transponder to drive in that lane as a carpool, which is inconvenient if you're just visiting. Fastrack is in effect on parts of the 110 Freeway between the 405 and 10 freeways, and on parts of the 10 freeway east of Downtown L.A. Cell phones: It is illegal to talk on a cell phone while driving in California without using a hands-free device. Holding a cell phone to your ear while driving will land you a ticket. Smoking: It is against the law in California to smoke in a car if you have a minor with you. Littering: There is a $1000 fine in California for throwing litter, especially smoldering cigarette butts, from a vehicle. Lane splitting: Motorcycles can legally split lanes (drive in between traffic lanes), so watch out for them. Alcohol: Driving under the influence (DUI) is taken seriously in L.A., and sobriety checkpoints spring up often in popular entertainment areas. The legal blood alcohol limit is 0.08%, but you can be charged with lower levels if they can show you are impaired. Driving (or sitting) with opened alcohol in the passenger area of the car, including the glove compartment, is against the law. Any opened container of alcohol has to be transported in the trunk. Los Angeles is infamous for its gridlock traffic in some parts. For the most part, the city is a grid with streets running north to south and east to west, so there are a lot of options for crossing town. Use these tips to know the best routes to take to get from point A to point B without the long wait or a headache. To make your way west or east, take either Santa Monica Boulevard, a bigger street that doesn't clog up too much and moves pretty quickly through Beverly Hills before taking a northern turn up toward Hollywood. Sunset Boulevard is a good option that takes you through Beverly Hills, West Hollywood, Hollywood, and downtown, but on weeknights, it can be extremely backed up. Stay away from Wilshire Boulevard, even if your destination is on it—the traffic can be so bad that it can take up to 30 minutes to go one mile. Washington Boulevard and Exposition Boulevard is good to get across town if you're further south. La Cienega is a good shortcut to know if you need to travel between Beverly Hills and West Hollywood and southern destinations along the 405 without having to take the 405, which can get more congested. Sepulveda Blvd runs closer along the 405 freeway from LAX into the San Fernando Valley, crossing the freeway several times. It's sometimes faster than the 405, but can also get pretty jammed itself. Crenshaw Blvd reaches from San Pedro in the south up to Wilshire Blvd in the Greater Wilshire/Hancock Park neighborhood just south of Hollywood. Crenshaw (usually off the 105 or alternate east/west street) can help to bypass downtown gridlock getting to Hollywood from Long Beach at rush hour. If you are going to an event at a large venue, there is most likely a paid lot or garage that can cost anywhere from $8 to $25. You can usually find flat-rate lots and garages near L.A. Live and the L.A. Convention Center that only charge a flat rate of $3 to $5, so consider that if you're headed somewhere near those spots. Here are some other types of parking to look for. Valet: Many hotels, restaurants, theaters, and malls offer this service, and depending on where you're headed, using the valet can save you the time and frustration of searching for a spot. And sometimes, they charge the same rate as a nearby lot or garage. However, it could take longer to retrieve your car after a busy event. Free street parking: This option is common in the L.A. suburbs and in some less-commercial urban neighborhoods, but is very rare in highly commercial neighborhoods. Side streets and residential areas might be an option, but they sometimes require a residential permit (possibly only on one side of the street), so look for signs indicating these rules. Also look for signs that indicate street sweeping hours. And other free areas might have a one- or two-hour time limit, and parking officers sometimes mark tires or take note of license plates, so stick to the limit specified. Meter parking: Most coin-operated meters in Los Angeles have been replaced by ones that take credit cards. The rates, days, and time limits on these vary by block. It's helpful that some meters notify you if you're trying to park during a restricted time, and they will not accept your payment. If you don't see a meter, look at the curb to check for a number—that means there's a Pay Station where you pay for the spot. Red Curb: No stopping, parking or standing/waiting at any time. Yellow Curb: Commercial loading only (30-minute limit with a commercial license plate, 5 minutes without) Monday through Saturday 7 a.m. to 6 p.m. unless otherwise posted on signs. White Curb: Passenger loading and unloading only for a maximum of five minutes. Green Curb: Short-term parking, 15 to 30 minutes as marked, Monday through Saturday, 8 a.m. to 6 p.m. unless otherwise posted. Blue Curb: Parking for disabled people or their drivers displaying a valid disabled parking placard or license plate. Should You Rent a Car in Los Angeles? Renting a car in L.A. can give you the advantage of flexibility. And if you're planning to visit places all over the city and are comfortable navigating yourself around, it's likely the best option. However, it's not impossible to visit and tour the city without one, so if you prefer to avoid driving or want to save money on renting a car, plus all the extras of parking, gas, and more, that's an option. If the latter is your preference, then stay in a location that's close to the majority of things you want to see. For example, you could stay in Hollywood, which offers plenty of things to see and do. And staying in Hollywood allows you to get to downtown L.A. rather easily via the Metro Red Line, the only fast transit in town. It can be time-consuming to get to Santa Monica or Disneyland from Hollywood by any public transit options, but it's not particularly complicated. Or Downtown L.A. is less touristy, but there's plenty to do, and it's easy to get to Hollywood, Universal Studios Hollywood, and Disneyland. Staying in the vicinity of the Music Center will put you close to theaters, museums, Chinatown nightlife, El Pueblo de Los Angeles Historic Site, and bars. If you're in town to go to an event at the Staples Center, Nokia Theatre, or the Convention Center, stay near L.A. Live. For a beach vacation (e.g. at Venice Beach), it's easy to get around by bike, bus, or walking. Follow these tips to blend in and stay safe on the road. Don't drive in the exit lane—The far right lane on the freeway is considered the slow lane, but on a multi-lane expressway, it's also the exit lane for people trying to merge on and off. By avoiding driving in this lane for long distances, you allow a better flow of traffic. 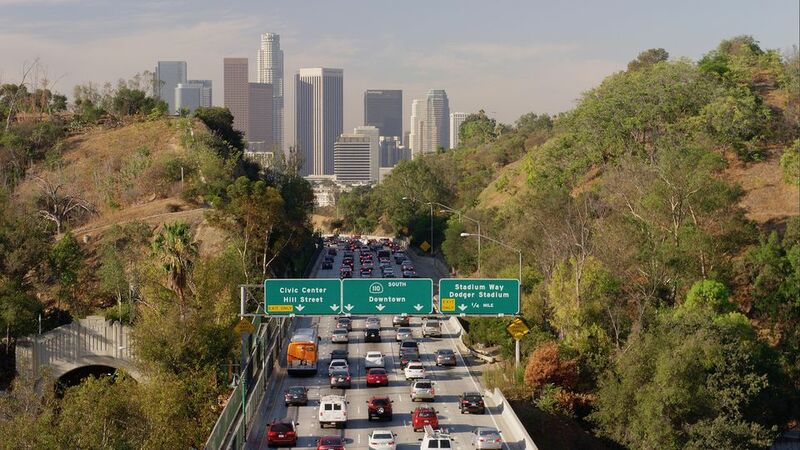 Leave time for lane changes—Some freeways in L.A. have six lanes, so give yourself plenty of time to cross multiple lanes for your exit, so you avoid trying to get off the freeway at the last minute and cutting people off, which can be dangerous. Don't honk—Angelenos don't honk unless there is an imminent danger or possibly a light tap to get the person illegally texting at a red light to notice the light is green. Honking simply because traffic isn't moving just identifies you as a tourist. Street names: In L.A., street names can change and then sometimes, they change back. Also, there can be multiple streets with the same name across different neighborhoods, such as more than one Main Street or Civic Center Drive. And sometimes a street is interrupted by an airport, a park, a body of water, a large cemetery, or some other obstacle, and then continues with the same name on the other side. Freeway exits with the same name: It's easy to be tempted to exit off a slow-moving freeway at a familiar street name, thinking it will take you where you want to go, but if you don't have a GPS or a local to confirm that it is, in fact, the same street, you could end up in a totally different place from where you intend to be.